Ji Eun-hee wins the LPGA Tour’s Kia Classic. March. 27, 2018 08:10. by Jong-Seok Kim kjs0123@donga.com. 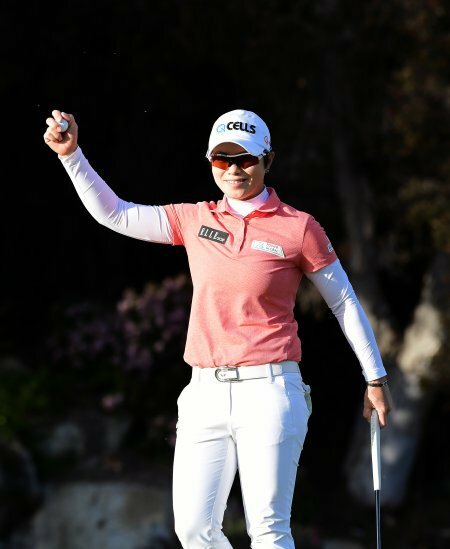 “It was my eighth lifetime hole-in-one, but the first with which I won the tour and prizes,” said South Korean golfer Ji Eun-hee (32, Hanwha Q CELLS), who grabbed the LPGA Tour’s Kia Classic title on Sunday. There was no hint of tiredness in her voice even after she drove around two hours to arrive at the location of the next tour. Though a taco was all she ate for dinner due to a busy schedule, Ji’s voice filled with joy as if she had enjoyed a sumptuous feast. In the fourth round of the tournament held at the Aviara Golf Club (par 72) in Carlsbad, California, Ji was leading only by a stroke when she stood on the tee box of the par-three 14th hole. Her tee-shot with the 7th iron, however, bounced on the green 60 centimeters away from the pin and rolled in, extending her lead from one to three strokes. While the chances of a professional golfer hitting a hole-in-one are known to be just around 0.04 percent, Ji’s hole-in-one was a well-timed surprise. Carding a 16-under-par-272, she clinched a victory by two strokes over Cristie Kerr and Lizette Salas of the United States. Looking back, it was certainly the magical hole-in-one that played a decisive role in her triumph. With her latest win, the South Korean golfer earned 270,000 dollars (around 290 million won) and two Kia Motors cars; a Sorento SUV for the hole-in-one and a sports sedan Stinger for the victory. Taking two sets of keys at the ceremony, Ji laughed saying that as she has an SUV back in Miami, she would think about how to use the two cars but said she would probably use Stinger. Ji is the oldest among Korean professional golfers taking part in the LPGA Tour. Since she captured the U.S. Women’s Open title in 2009, it took eight years, 3,025 days to be exact, for her to win her third tour, the Swinging Skirts LPGA Taiwan Championship last year. The 31-year-old golfer said that she received around 200 text messages congratulating her victory in just a few hours. Ji recently had an intensive training three hours a day to correct her putting. “I even asked junior golfers Kim Hyo-joo and Kim Ji-hyun to help me with putting. I guess I should treat them to a nice meal,” she said. Thus far, Korean golfers have clinched three victories at six tours this season. Following Park In-bee (30) last week, Ji has become another champion in her 30s who grabbed a title. Ji’s nickname is Mickey Mouse, because of her smile resembling that of the cartoon character as well as her fair complexion and black clothes she wears often. Sunday’s tour was indeed a story with a happy ending for Ji, just like a Disney movie.